April 15th is fastly approaching. Many of you have already filed because you are getting a refund, but many of you haven’t knowing you may owe in the end. But you have nothing to worry about. Here are some tips on how to have a successful tax season and beyond. Only pay what you owe – your goal every year needs to be to break even with your taxes. This is what the withholding calculator on the IRS website is for. Owing the IRS is not convenient and giving them too much every month resulting in a large refund is taking away money you need. Using the withholding calculator will get you very close and keep things easy and stress free. Make sure to use the calculator in Feb and again in Sept to keep yourself on track. Receipts, receipts, receipts – Make sure you do not take any deductions that you cannot back up with a receipt. And keep those receipts with your copy of your return for 7 years. The 2 main reasons for an audit are random screening and red flags. Either way, receipts will make this process simple should it ever occur. Use a professional when necessary – if you have a lot of deductions or sources of income, are self-employed, basically anything other than a simple return, hire a professional. 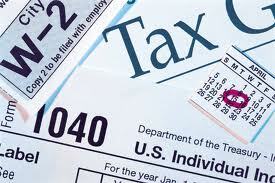 It will be worth every penny to make sure you take all allowable deductions and to make sure your return is accurate. Owe money – don’t panic – if you owe this year don’t panic. You can set up an installment agreement if you do not have the cash on hand. You will want to pay it off as soon as possible and use the withholding calculator to fix the issue going forward. But not filing because you owe is a serious mistake. One reason is it is against the law. Another reason is there is an additional penalty for not filing on top of everything else. It is not worth it and not necessary. Most people hate taxes and tax season. But there is no need. Taxes are part of life. How you handle them will determine how stressful they are to you. My final advise – file you taxes whether you owe or not. If you do, set up an installment agreement and pay as soon as possible. Use the withholding calculator to fix the future and move on with your life. If you set things up right, April 15th is just another day. Many Americans are very critical of how the federal government is handling the federal budget. Yet, many Americans have the same issues within their own household budgets. The problem with both is actually very simple. We are spending more than we are making. The federal government will take in $2.17 trillion in 2011. They will spend $3.82 trillion. This means they are spending $1.65 trillion more than they will make. On top of that, they owe $14.2 trillion in debt. Let’s compare this to an average family in America. If a family has an average income of $55,000, they would be spending $96,000 (175% of their income). They would then add the $41,500 of 2011 debt to the already existing $366,000 of existing debt. If this family came to me, believe it or not, I would be able to help them and eventually get them out of debt, with a lot of sacrifice and time. They would have to lower their spending and raise their income. It is really that simple with the federal government as well. Budgets are just really big math problems. The hard part is the emotional decisions and sacrifices that have to be made. I hope that we as a country can make it a priority to get our own house in order. Complaining about the federal budget isn’t going to change anything. You can bring about change, first, by changing your own household budget. When you have a positive household budget, you are able to give more and help people who are in need. We need to learn to help each other. It worked for our grandparents and it will work for us. If you can, financially, find someone to help today. If you can’t, work on your budget so you can. Americans helping Americans! Love it! Do You Have a Government Savings Account? Well, here we are again. It is January, a new year, and tax time. Do you dread this time of year because you end up owing every year, or is this the best time of year for you because you are anticipating a big check from the government? I think that many people miss the goal of the tax system. I have many clients come in who can’t make their monthly bills, but receive $1000’s back every year on their tax return. When you receive a refund check from the IRS, you are actually receiving your own money back. A refund check is not the government sending you free money. When you receive a refund, it means that you paid too much in in taxes over the year and the government held your money for you at 0% interest. Your goal should be to be as close to $0 as you can at the end of your tax return. That way, you give the government what you owe them and you get to keep the rest for yourself. If you are owing money every year or are receiving a big refund every year, you need to change your W-4 with your employer to the correct number of exemptions to get you to $0. On the IRS website, www.irs.gov, they have a withholding calculator tool that will help you determine what your W-4 should be. Make sure you enter everything accurately and if you do, you should be within about $25 on either side. Your money is your biggest wealth building tool and you want to make sure you keep as much of it as you can. If you have been getting a refund, take the extra money you will be getting in every paycheck and get out of debt or if you are out of debt, invest it and let it grow for you. If you need any help determining what your W-4 should be, please contact me at www.debbiking.com and I will be happy to walk through it with you.